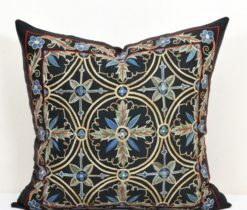 Hazara embroidery nomadic design sofa pillow adorned cross-stitch with silk thread. 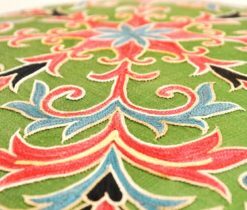 Heighten visual stimulation to the utmost degree of intensity in the decoration of embroidery stitches of the Central Asian nomads. 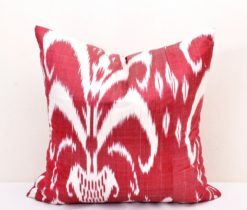 See this beauty in your farmhouse interior. 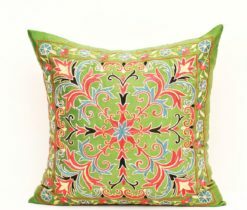 This embroidered suzani accent brings a favorable touch of richness to the traditional fulled-in motif of this applique design. 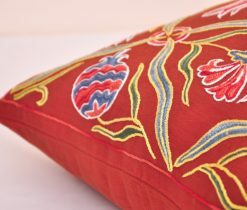 Accented design of floral pattern is most vividly evoking springtime and blossoming. 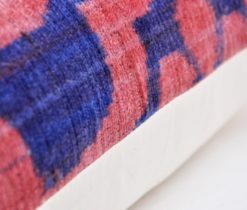 Hense colors are matching wonderfully with stylized version edges. 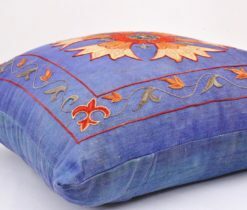 Thus, it brings a sweet nostalgia of old days. Update the look of a chair or sofa with a piece of ancient nomad art to your interior. 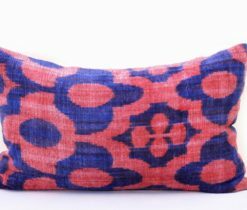 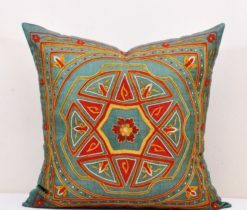 Suzani Lumbar Pillow would be great well-composed with your couch. 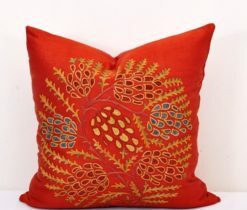 This decorative embroidery pillow great for oriental bohemian decorating style. 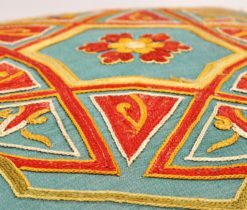 The shapes for the pattern enriched with couching stitch for a dowry in the Bokhara. Carnations and motifs are the sheets of contrasting colors. 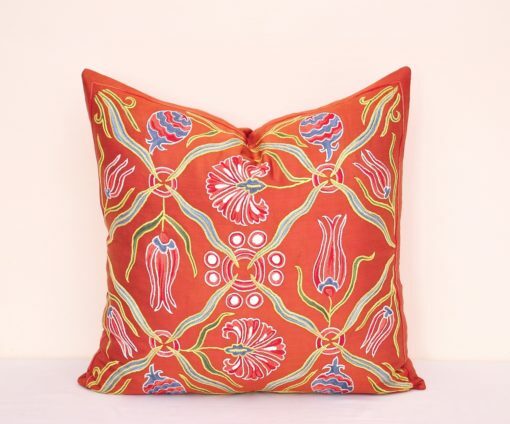 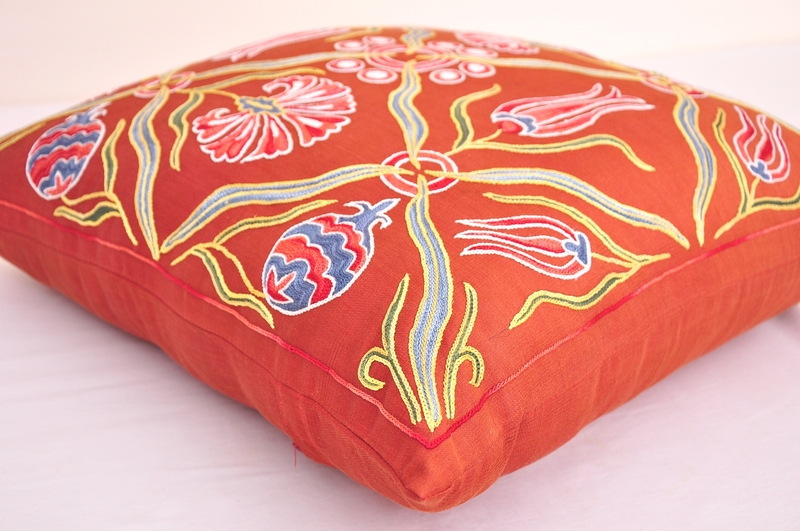 It is a one of a kind throw pillow beautifully worked in silk thread tambour. 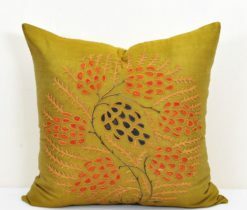 Moreover, cute chain stitch forms the superb design. 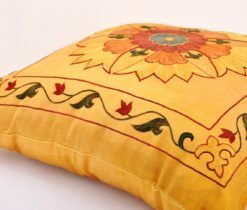 Because of the unique style and handmade nature of this pillow cover, it gives unrepeatable design to your house decoration. 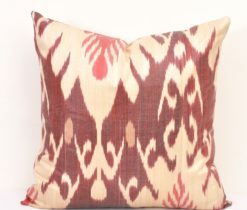 Mix and match according to your design needs. 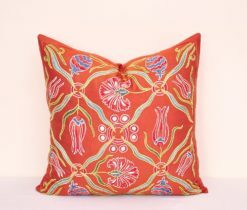 Slip in a pillow insert, fluff and place anywhere in your home. 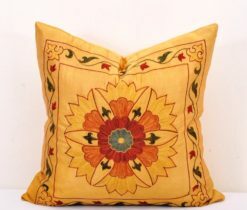 Suzani embroidery is a production of art lover. 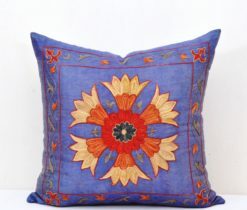 First, embroidery suzani decorated with geometric motifs on a plain fabric. 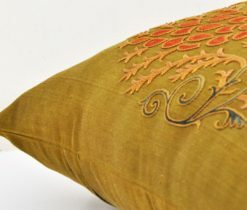 Then hand-dyed. 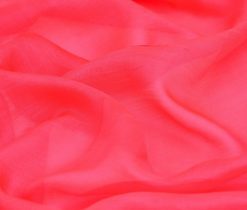 Warp threads are bound and dyed at least six times. 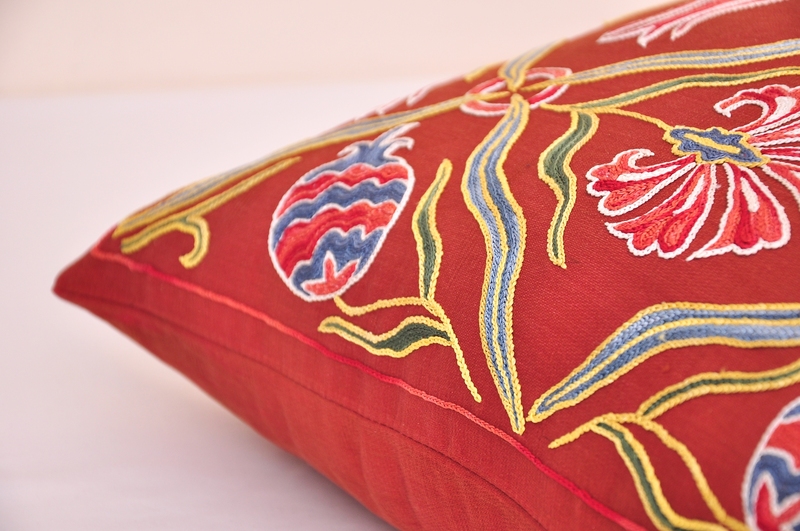 Particularly, traditional suzani pattern gets a new look with an authentic tribal design and softly shaded colors. 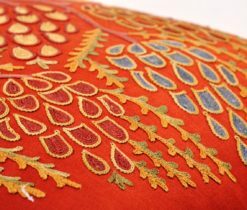 To decorate a solid fabric ith embroidery satisfies the creative instinct, of course. In East the skill of embroidery is hereditaryto the culture. 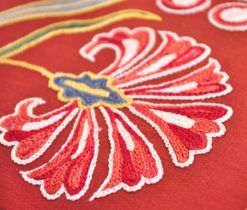 Embroidery stiches applied with a needlework or tambour hook. 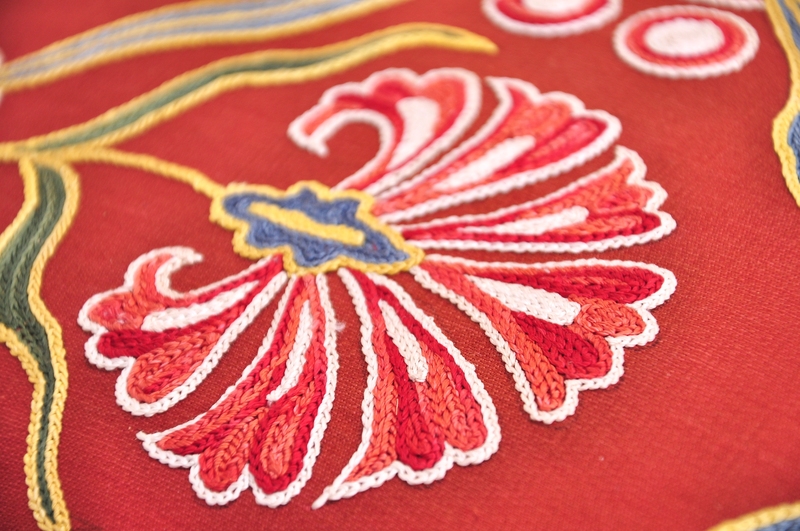 That is why, embroideries are unique in style, in its asymmetrical motifs. 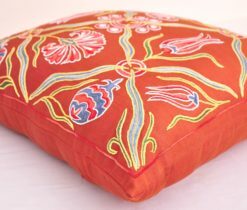 Hot Red Turkish Embroidered Suzani Pillow Cover square measure sewed professionally, over-locked with finished edges and has invisible zipper enclosures. 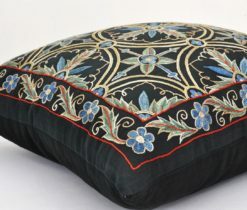 This provides long lasting, sturdy covers which will keep straight and delightful over time, that makes for a clean sophisticated look.